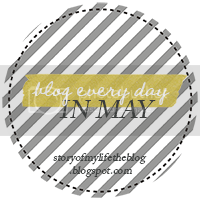 When I first saw the list for the Blog Everyday in May challenge I was having serious trouble thinking of my most embarrassing moment. Thankfully, Carolyne-Grace took care of that for me yesterday when we were at Target. We had to run into Target before swim lessons because I wanted to get her a new bathing suit. As we were walking in CG screams "EWWW MayMay that man smells like cigarettes!!!" and POINTS at a man no less than three feet from us. Instant embarrassment. We had a nice little chat about how we keep comments like that to ourselves or wait until no one is around ; ) I know there are many more of these "moments" to come when I have my own kids, but at the time I was SO embarrassed!! Haha, so cute and hilarious at the same time. Cute but I can see why it would be embarassing..my nephew has done stuff like that to me! Haha that is so cute! I know a little boy who ran up to a lady and asked if she was pregnant. When she replied that no she wasn't he said "well then why are you so FAT?" His mum was mortified! Haha that reminds me of when I was babysitting 5 year old twins and one of them felt the need to ask the cashier (at target) if she was a man or a woman (she was a woman that had a short haircut). Then when she said she was a girl Maureena then asked why she looked like a man. I have never moved out of a store so fast in my life. Kids really will say what is on their minds haha! Kids really do say the darndest things! She is a smart little girl to already be so against smoking, haha!